The global market for cancer cachexia market is currently in the budding stage. On the grounds of promising clinical pipeline and imminent regulatory approvals, this market is expected to witness exceptional rise over the coming years. The unmet need for the treatment of cancer cachexia in developing economies is also expected to drive the growth of this market substantially in the near future. In 2016, the global cancer cachexia market stood at US$1.63 bn. Analysts project the opportunity in this market to proliferate at a CAGR of 4.90% over the period from 2017 to 2025 and attain a value of US$2.51 bn by 2025 end. The global market for cancer cachexia is assessed on the basis of therapeutics, mechanisms of action, and the distribution channels. Based on the therapeutics, the market is categorized into progestogens, corticosteroids, and combination therapies. Among these, progestogens are considered to be the best available treatment option for cancer-related cachexia across the world. The popularity of progestogens is so much so that these are the only drugs approved in Europe for the treatment for cancer cachexia. This drug segment is expected to remain on the top over the forthcoming years. Based on the mechanism of action, the market is classified into appetite stimulators and weight loss stabilizers. In terms of distribution channels, the market is bifurcated into hospital stores, retail pharmacy stores, and online pharmacy. In terms of the geography, North America, with a share of 40%, led the global market for cancer cachexia in 2016. This regional market is projected to remain leading in the near future, thanks to the increasing awareness among people and healthcare professionals about cancer supportive care. Apart from this, the presence of pipeline drugs in phase 3 clinical trial, which will be rolled out in the market over the next 2-3 years, are also expected to drive the market for cancer cachexia in North America in the near future. Europe, which has been following North America closely, is predicted to surface as a more lucrative market for cancer cachexia over the forthcoming years, owing the continued practice of offering discounts on drugs, specifically used for the treatment of cancer, by manufacturers in this region. Similarly, Asia Pacific is also projected to report attractive opportunities for the growth of the worldwide market for cancer cachexia market in the years to come. The cancer cachexia market in Asia Pacific is expected to register a significantly high-paced growth in the near future, thanks to the presence of massive pool of undiagnosed patients, rapid urbanization, rise in disposable income, increasing government support for healthcare, and the augmenting awareness about cancer cachexia among people here. Æterna Zentaris Inc., Alder BioPharmaceuticals Inc., Aphios Corp., Eli Lilly and Co., GTx Inc., Helsinn Group, Merck & Co. Inc., Novartis AG, Bristol-Myers Squibb Co., and XBiotech Inc. are the main players functioning in the global market for cancer cachexia. The market demonstrates a highly competitive business landscape with players competing on the basis of innovation and technological advancements in their offerings. It also provides information and data analysis of the global market with respect to the segments based on therapeutics, mechanism of action, distribution channel, and geography. A detailed qualitative analysis of drivers and restraints of the market and opportunities has been provided in the market overview section. In addition, the section comprises competitive matrix and company profiles with business overview to understand the competitive landscape in the market. This section of the report also provides market attractiveness analysis, by geography and market share analysis by key players, thus presenting a thorough analysis of the overall competitive scenario in the cancer cachexia market. The global cancer cachexia market has been analyzed on the basis of therapeutics, mechanism of action, distribution channels and geography. Major therapeutics segments are progestogens, corticosteroids combination therapies, others. The others segment of global cancer cachexia market includes pipeline therapeutic approach. Thus the market of others segment has been considered as addressable market. According to mechanism of action, market is segmented in to appetite stimulators, weight loss stabilizers, and other mode of actions. Hospital stores, retail pharmacy stores, online pharmacy are considered as preferred distribution channels. The market is driven by argumentative lifestyle habits leading to lung cancer, rising incidence rate of cachexia mainly in the developed region like the U.S., Europe and Japan. Moreover, increasing funding for cancer research by government and private organizations, increased awareness about palliative care will further the demand for cancer cachexia drugs in near future. While, stringent regulatory requirements and long procedure for FDA approval have discouraged cancer cachexia drug manufacturers. The market size and forecast for each of these segments have been provided for the period from 2015 to 2025, along with their respective CAGRs for the forecast period from 2017 to 2025, considering 2016 as the base year. 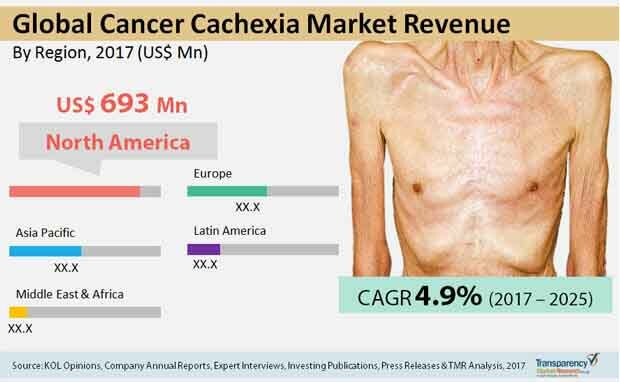 Geographically, the global cancer cachexia market has been categorized into five major regions and the key countries in the respective region: North America (the U.S., Canada), Europe (the U.K., Germany, France, Spain, Italy, and Rest of Europe), Asia Pacific (India, China, Japan, Australia and Rest of Asia Pacific), Latin America (Brazil, Mexico, and Rest of Latin America) and Middle East & Africa (South Africa, GCC countries and Rest of Middle East & Africa). The market size and forecast for each of these regions and the mentioned countries have been provided for the period from 2015 to 2025, along with their respective CAGRs for the forecast period from 2017 to 2025, considering 2016 as the base year. The research study also covers the competitive scenario in these regions. The report also profiles major players in the global cancer cachexia market based on various attributes such as company overview, financial overview, product portfolio, business strategies, and recent developments. The major players in the women’s health market are – Æterna Zentaris Inc., Alder BioPharmaceuticals Inc., Aphios Corporation, Eli Lilly and Company, GTx, Inc., Helsinn Group, Merck & Co., Inc., Novartis AG, Bristol-Myers Squibb Company, and XBiotech, Inc.